Should the Eco branding lure you into parting with your green? Spare a thought for memory makers. In this age of integrated controllers and copious BIOS options, the need for high-end RAM is increasingly questionable. Then again, the G.Skill Eco 1.35V CL7 memory kit doesn't suffer from too many high falutin' performance pretensions. Instead, the emphasis here is on sustainable, efficient performance. That's right, this is a memory kit for tree huggers. That's not to say the specifications are poor. On the contrary, the G.Skill Eco 1.35V CL7 is a dual-channel DDR3 memory kit suitable for Core i3, i5 and i7 systems based on the LGA1,156 socket and comes with some speedy specs. The official frequency of 1,600MHz qualifies as quick, if not warp speed, while the 7-8-7-24 timings are hardly tardy. However, it's the supported operating voltage of 1.35V that really sets this kit apart. 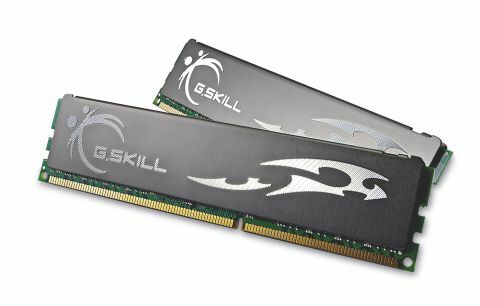 It's significantly lower than the 1.65V specification of most DDR3 kits and translates into what G.Skill claims can be improved efficiency and environmental friendliness. Note the use of the conditional here – it will be interesting to see whether G.Skill can really deliver.